Any remaining sauce is delicious served warm with cold turkey or ham on Boxing Day. Finely grate the orange rind and squeeze the juice. Place the cranberries, sugar, port or red wine and orange juice in a saucepan with the ginger and clove and bring to the boil. Simmer, gently, uncovered, for about 25 minutes. Remove about half the cranberries with a slotted spoon. Find the clove and remove. Blend the remainder of the sauce until smooth then stir in the reserved whole cranberries and the orange rind. Cool, cover and store in the fridge until required. 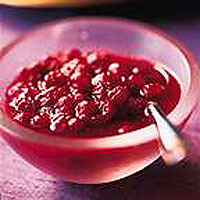 Add the grated rind and juice of 1 orange plus a little finely grated fresh ginger to Waitrose Cranberry Sauce. Or try Waitrose Cranberry and Burgundy Sauce.